Two of the most annoying factors about going to movie theaters has to be talking and the use of cell phones during the film. But thanks to Jeff Goldblum's business consultation firm, Alamo Drafthouse theaters may have found the solution to terrible moviegoers. In a new video, the Jurassic World: Fallen Kingdom star introduces Sheila, the anti-talking and texting velociraptor, who will devour and eat anyone who decides to break the rules in the movie theater. Sheila does not mess around, so you might want to think twice about pulling your phone out during Infinity War. 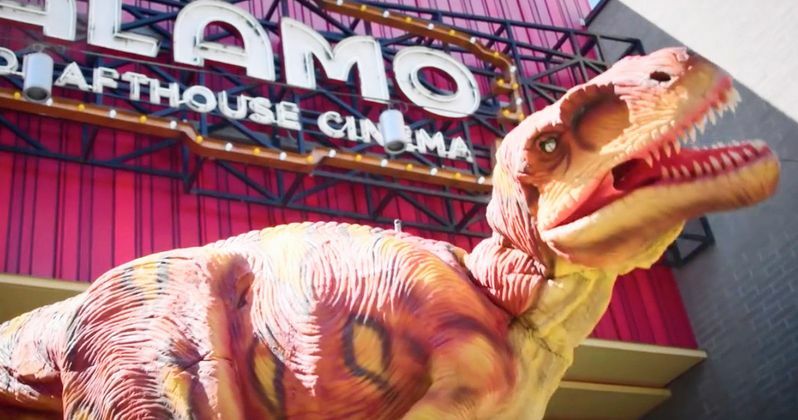 The new Alamo Drafthouse video is obviously fictional, but it's pretty hilarious and could prove to be effective. Jeff Goldblum reveals that in addition to being a character in Jurassic World 2, he's also a business consultant who has offered his services to Alamo Drafthouse to raise awareness about rude behavior in the movie theater. Goldblum, with a straight face, introduces Sheila the anti-talking and texting velociraptor. Sheila eats a rude customer who is asked to get off of her phone. The cell phone is a part of everyday life and when attending a movie, we are shown at least two warnings about pulling out the phone during the film. It's hard to believe, but there are still some rude moviegoers who have no problem talking or texting while the movie is playing. Theater workers can only do so much, which is why bringing a dinosaur in to eat the unruly customers is a pretty awesome idea, especially since it also promotes the upcoming Jurassic World 2 and shows off how well Jeff Goldblum works off the cuff. Jurassic World 2 hits theaters on June 22nd and is expected to bring in some pretty big box office numbers, according to predictions. The highly anticipated sequel could bring in $130 million to $150 million during its debut weekend. While those are awesome numbers, they aren't as high as the first movie, which brought in $208 million in its opening weekend. It's entirely possible that Jurassic World 2 will end up doing a lot better than the predictions indicate and the sequel could very well match the earnings from the first installment, but we'll just have to wait and see. Jeff Goldblum is back as Doctor Ian Malcolm for Jurassic World 2 and fans of the dinosaur park franchise are extremely excited for his return. Hints of Dr. Malcolm's return were teased last summer when the first posters for Jurassic World 2 were unveiled using his famous words from the first Jurassic Park: "Life Finds a Way." While the sequel has been accused of showing off the entire plot of the movie in the trailers, director J.A. Bayona says that they barely scratch the surface. And if anyone knows, it's Bayona. You can check out the new Alamo Drafthouse anti-texting and talking video featuring Jeff Goldblum below, thanks to the Alamo Drafthouse YouTube channel.